GBC offers over 70 years experience in designing and producing top-quality shredders. GBC production shredders come with a complete three-years warranty (with lifetime warranty on cutting heads), and GBC has the industry's only on-site factory service program plus hundreds of servicing dealers. Solid one-piece cutting head to handle staples and paper clips. Bag-Full Sensor to shut off shredder before back-end jams occur. Auto Stop on Jam to minimize motor wear and tear. Deep, funnel-shaped throat - simplifies paper feeding by accommodating oversized sheets and disorganized stacks. Automatic On/Off - provides convenient one-handed operation. 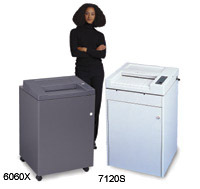 Large Shred Bins - allow for long runs between bag changes and casters provide easy mobility. "Ideal for centralized office use by multiple users in a department or company for higher security." The GBC 7160X Office Shredder - Cross-cut security and bulk reduction combined with productivity. The shredder feeds 25 to 30 sheets at a time at a fast 30 feet per minute, including staples and paper clips. Each 8 1/2 x 11in sheet is shredded into over 200 unreadable 3/16 x 2 3/8in chips. The shredder has an auto on-off operation. Powerful continuous-duty motor. Full size, 16in opening, suitable for all types of shredding applications from regulation paper up to EDP-computer size paper. Extra large 6.35 cubic foot shred bag capacity. The shredder's bin-full indicator and reverse function insure trouble-free operation. SmartShred controls: Four visual indicators keep you informed - Power On, Bag-Full, Overload and Door Ajar. Jam-Stopper electronics: Solid one-piece cutters shred staples and paper clips without jamming. Bag-full sensor shuts off shredder before back-end jams occur. Auto stop on jam eliminates motor wear and tear. 38.5"H x 24"W x 22"D.
© 2019, All Rights Reserved by GBC Shredder, Powered by Clary Business Machines Co.